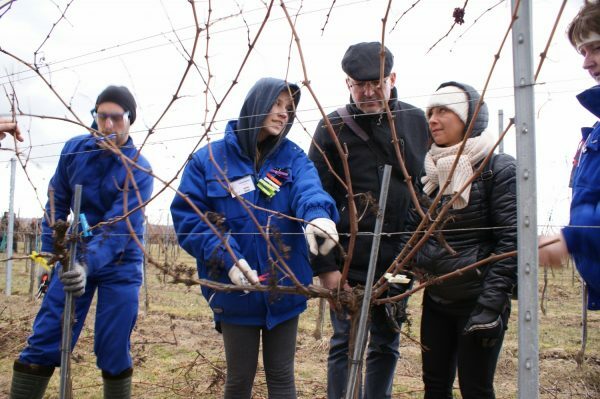 Following the Erasmus+ KA2 project VITEA the wine school Krems has introduced an international training course to become a qualified vine pruner. The course will be held in December 2019 on school premises in Krems and lasts 7 days. The demand on qualified labour force in viticulture has been growing over the last years due to a reduction in numbers but increase of size of wineries. Small wineries were managed with family members in the past, but more and more of them close down because of a lack of successors. Many hours of practising needed to improve the skills. The project VITEA focused on the objective to achieve a European certification of professional training recognized by all European wine-producing countries in the vine pruning sector.The VITEA project aimed at testing the pedagogical tools created to assess and validate vine pruning competences in the European framework. To meet employers’ and workers’ needs, VITEA concentrated on winter pruning: the «heart» of job. To meet learners’ needs, VITEA defined what they have to know before assessment: Units of Learning Outcomes, Assessment grids, Prerequisites, Assessment Conditions, Taking into account their results. The program covers the tuition for theory and practice of vine pruning, a final assessment, certificate, field trips to growers practicing soft pruning, cultural program, full board and lodging. The training course is an ideal possibility to acquire new skills in viticulture and could be combined with an Erasmus+ KA1 mobility project.